I'm linking up with Gussy's Inspiration Workshop again this week, using the prompt "green." It's the perfect segue to introduce you to the new thrifted [sort of] member of my gardening team! For Christmas, my parents gave me a copy of The Beginners Guide to Preserving at Home. It got me more excited than ever to get my garden planted, growing, and process the bounty that was sure to follow. 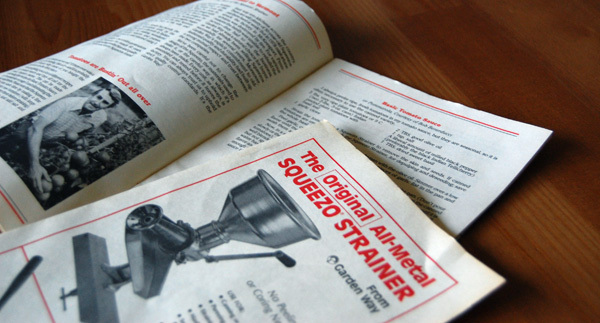 The author listed a Squeezo strainer as a must-have for this endeavor, but new on Amazon it runs $195. Sad face. Purchased from a nice man for $25, this sturdy piece of 1982 vintage has seen very little use, and besides a dried out rubber gasket, it's in perfect condition! It promises to make my applesauce [using orchard apples + no sugar] and salsa [using homegrown tomatoes + peppers] processing 10x easier to accomplish this year. I love knowing exactly what's going in my food and catering the flavor to our liking. My goal for this year: canned pizza sauce! 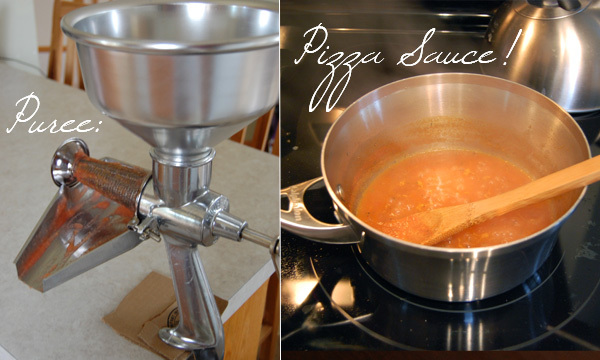 My husband and I love pizza [especially Papa John's], so what better use for the Squeezo than to puree some fresh tomatoes and make pizza sauce? No blanching, no peeling, no seed-removing. Too easy. What about you? Are there things you prefer to make from scratch? Wow, I'd never seen one of those before. How'd the sauce turn out? It had a great taste, but the 5 tomatoes I pureed cooked down quite a bit and left us with less sauce than expected. Thankfully there's time to tweak the recipe before my own tomatoes are ready! We make spaghetti sauce from scratch in my little household. Its so simple to do, and has a fresh taste that the bottled stuff can't beat! New follower! Oh my goodness, how awesome! I would love to make my own spaghetti and apple sauce. Hoping to do some canning for the first time this year.